Marguerite S. Sanvictores is an attorney with Panish Shea & Boyle LLP and focuses her practice in complex catastrophic personal injury litigation, product liability and wrongful death cases. Specializing in cases involving traumatic brain injuries and spinal cord injuries, Ms. Sanvictores and her trial team have successfully settled over $20 million for their clients. In 2018, Ms. Sanvictores and attorney Spencer Lucas obtained a $5,000,000 settlement for two men who were seriously injured when a Ford F-150 truck driver by a VSC Farm employee made an illegal left turn in front of their vehicle in Ortiz v. VSC Farms, LLC, as well as a $3,919,000 settlement for the family of a man who was killed while walking in a crosswalk due to an improperly programmed pedestrian countdown that left him stranded in the middle of the road where he was struck and killed by a vehicle in Patel v. City of Chino Hills. 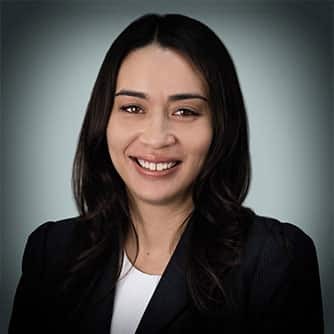 Prior to joining Panish Shea & Boyle LLP, Ms. Sanvictores was a senior associate with Masry & Vititoe, LLP where she co-wrote an appellate brief that became a first impression published opinion in the California Courts of Appeal, Second District. Ms. Sanvictores is a member of the California State Bar and received her law degree from Southwestern Law School. While attending Southwestern, she received the Dean’s Merit Scholarship, Harvey L. and Lillian Silbert Public Interest Fellowship Scholarship, and the CALI Excellence for the Future Award. Ms. Sanvictores was also elected to the Moot Court Board of Governors where she received numerous awards, including Quarterfinalist in the National Asylum & Refugee Moot Court Competition, Second Place finalist in the New York City Bar Nationals Moot Court Competition and was awarded the Moot Court Board of Governors Scholarship. Ms. Sanvictores also worked for the Legal Aid Society of Orange County where she worked at the Compton courthouse and assisted low income individuals with various legal matters. A graduate of California State University, Northridge with a degree in Political Science and Law and Society, Ms. Sanvictores was on the Dean’s List and was the Head Delegate of the University’s Model United Nations Team. She received various awards for her University, including the Model United Nations Leadership and Service Award, City of Los Angeles Achievement Award for Model United Nations, Outstanding Delegation and Position Paper Award, representing Afghanistan in the International Atomic Energy Agency, Outstanding Delegation and Position Paper, representing Kazakhstan in the Special Session on Global Warming, Excellence in Research Position Paper Award, representing Rwanda in the United Nations Children’s Fund, and Distinguished Delegation Award, representing Sierra Leone in the General Assembly Plenary. She also attended American Association of Justice Deposition College in Newport, RI, and the American Association for Justice Advanced Deposition College in New Orleans, LA. Ms. Sanvictores is an active member of Consumer Attorneys Association of Los Angeles (CAALA), Consumer Attorneys of California (CAOC), and the American Association of Justice.n active member of Consumer Attorneys Association of Los Angeles (CAALA), Consumer Attorneys of California (CAOC), and the American Association of Justice.